first, an excerpt from the animated movie of our favorite bone book, Dem Bones by Bob Barner. the music is by Raul Malo. paper dolls of the saints! i’ve mentioned recently how wonderfully meditative coloring has become for me. add in these whimsical drawings by Vee and a subject matter that’s rather close to my heart. and well, i’m in heaven! finally, why not make some of Lyanda’s Day of the Dead cookies. or some of these absolutely festive Pumpkin Oatmeal Scotchies. a batch of these are going in the oven right after tonight’s dinner cornbread. 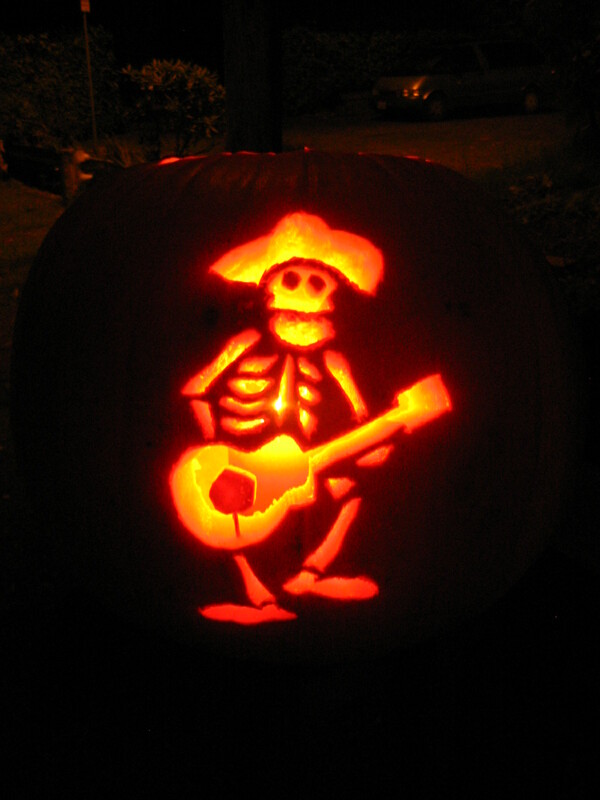 I love your pumpkin and he fits the spirit of the occasion. Trev had a hard time giving his pumpkin up so we buried it in the middle of the garden where it will help other things grow.